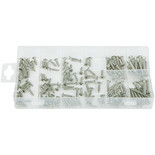 Quantity x Diameter x Length (mm) 15x4.0x64, 30x3.2x50, 50x3.2x32, 100x2.4x38, 150x2.4x25, 210x1.6x25. 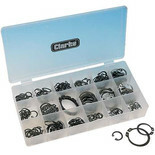 A varied selection of internal and external retaining spring circlips ready at hand for immediate selection as and when required. 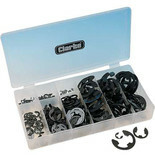 A comprehensive assortment of compression and expansion springs to suit numerous repair, building and development projects. 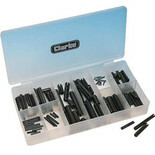 A good chance you'll find the one you need. 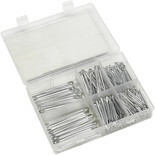 A selection of 30 different sizes of roll pin clips offering every chance of having the one you need. 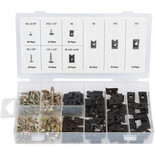 A useful selection of these fixing devices in 9 different sizes. 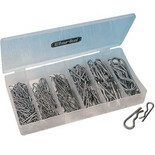 This useful selection of R-Clips / Hitch pins, in six different sizes, will cover virtually all general requirements. 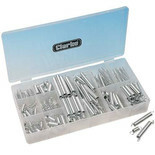 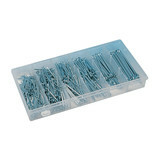 This Clarke 262 piece set offers 5 sizes of galvanised steel pins supplied in a snap open case for easy storage.